The Crossroads. Anesidora is, like Grand Central Station. It is the crossroads for allowing planes-walkers, and non-planes walkers etc. to travel through to other realms, worlds, nations, dimensions continents and territories by a means of portals, rifts, ripples, veils, bridges, magics, and technologies - when someone travels through a portal on Anesidora the portal gives the RPC an awareness of the universe they are in, and the atmosphere within it, allowing automatic usage of such universes abilities. 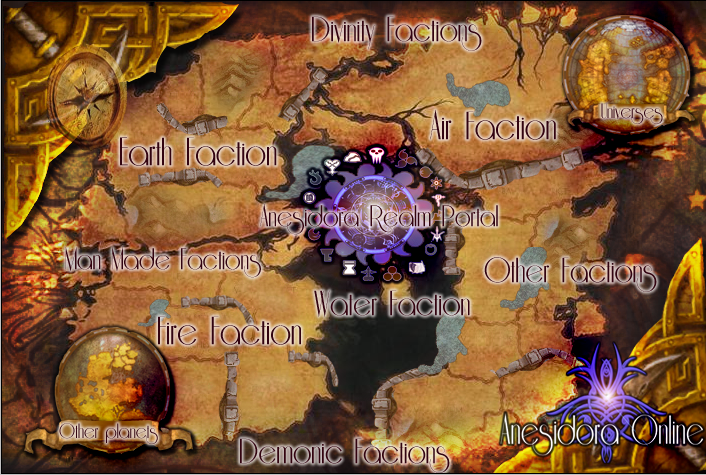 These areas' are located all over Anesidora; some are accessible while others are locked for whatever the case. Whenever a world is created, or brought into existence there is a hallway or bridge etc. that is built which connects them to the realm of Anesidora. And the pathway is locked until opened by the border guards on the other side. Once it opens up for the first time to Anesidora; it must be closed by both border guards on both sides to be sealed once again.